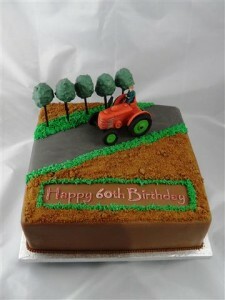 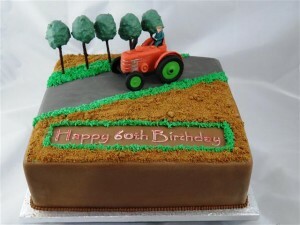 Another transport themed cake, this time a monster of a 12″ square rich fruit cake for a fan of tractors – complete with model tractor provided to work from! 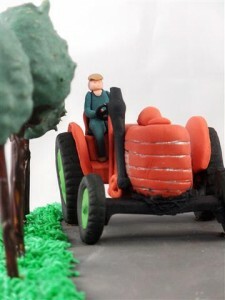 This time the model had to be 3D and standing on top of the cake rather than in relief as I have done before – I made the model over several days to give the parts time to dry out before assembly. 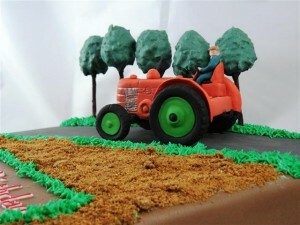 The trees are cakepops made from some of the trimmings of the main cake when levelling – as always, everything on this cake is edible – bar the cakepop sticks which I painted with chocolate to look like tree trunks.